WhatsApp is not a popular app for any reason, but it’s because of the sheer efforts the company dedicates into ensuring the billions who use the app have the best features that are also easy to use. 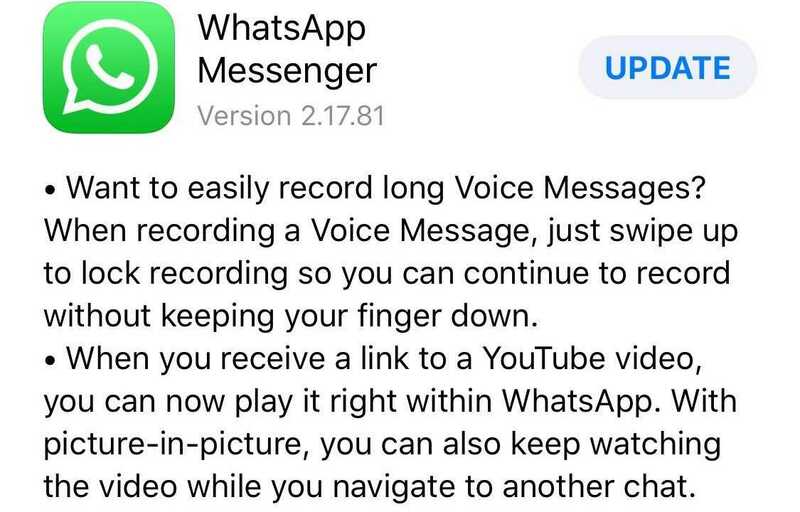 Since its 2013 introduction, WhatsApp audio recording hasn’t gone through so many changes or rather updates. In fact, the latest version brings the biggest change the feature has seen since its launch. Typically, sending an audio message on the app requires users to tap and hold the microphone button in the open chat. Even though this is a very simple way of doing things, it has a few limitations. For instance, when holding the mic button, one cannot do anything else on the app, including scrolling through the open chat for more info that may be valuable to the voice message being recorded. However, with the new update, your hands will now be free to perform other things. To record a voice message in the new version, you’ll have to swipe up rather than tap and hold. This will lock the app into recording mode, which means you can now continue voicing your message hands-free. The update also brings another nifty feature in the shape of in-app YouTube support, where users will no longer be redirected to their YouTube apps in order to open a YouTube link sent through the app. Instead, the link will now be opening right from within the app. With picture in picture mode, WhatsApp users will also be able to keep watching the video as they do other stuff on the app. The latest additions are coming in as part of WhatsApp v2.17.81, which can be downloaded via the iTunes App Store right away. As usual, the update also adds performance improvements and bug fixes, but don’t hesitate to share with us all the new stuff you can see in the updated version.